President, Gait and Lameness Evaluation, Inc.
Wayne Blevins grew up in a south side neighborhood of Chicago, Illinois. At age 13 he got his first job as an assistant wrangler with the Christian Organization "Young Life" at their Ranch in Colorado Springs, Colorado, helping to take out rides and caring for a string of thirteen trail horses. The next summer he also worked as the assistant wrangler at "Star Ranch", an experience that he would remember all his life. After graduating from Morgan Park High School he attended Chicago JR College and then moved on to New Mexico State University where he graduated in 1970, with a Bachelors degree in Business Administration. He then enlisted in the U.S. Coast Guard, attended Navy Parachute Rigger and Ordinance schools to achieve a petty officer rating of Aviation Survivalman Third class, and served as a flight mechanic, aboard both fixed wing and helicopter, flying many search and rescue missions. 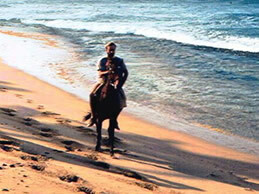 Stationed in Puerto Rico for three years, he spent many hours, off duty, owning and riding smoothly gaited Paso Fino horses prominent on the island. The only person available to trim hoofs was a chief petty officer in the Navy, Randy Welch, who had organized a riding club on the local Navy base in Isabella. Wayne took interest in the skillful knife work and general horsemanship talents displayed by Randy and others. The Military draws its personnel from all over the US, so the members of the club brought a variety of horse skills for Wayne to learn. Before leaving Puerto Rico Wayne joined Randy Welch in shipping 35 Paso Fino horses to the US. One Stallion and two mares belonged to Wayne. In June of 1974, he was honorably discharged from military service and attended the Midwest Horseshoeing School in Macomb, Illinois. The emphasis at that school was standardbred and roadster ponies; this helped immensely in learning the full spectrum of gait. As a breeder, trainer, and importer of the Paso Fino horse Wayne’s shoeing specialty for many years afterward was the four beat gait. 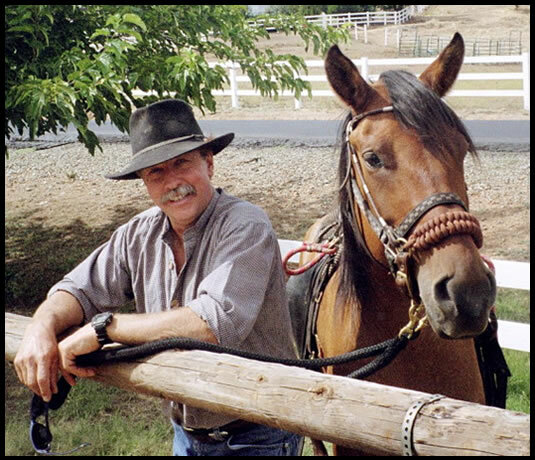 In 1975 he moved his horses to his first Paso Fino Ranch, that he built on twenty acres in Mendocino County California and started a horseshoeing business. In 1980 he helped to form the California Paso Fino Horse Association (CPFHA). He was the Northern California Rep for the breed and also on the board of directors for CPFHA for about ten years. During the 1980’s and 90’s Wayne co-managed and co-owned Vista Moraga Paso Fino, a horse breeding and training facility in the east-bay area of Northern California. Again his interest was in the gait of the horse and developed shoeing, trimming, and training techniques, that worked well for his Paso Fino clients as well as the general pleasure horse customers that he served. In 1996 he formed Gait And Lameness Evaluation, G.A.L.E. Inc., for the purpose of studying and documenting gait with digital video, and moved to El Dorado County where the horse population was abundant. 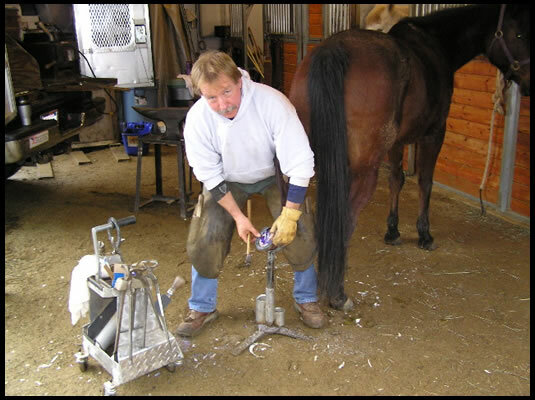 Most horseshoers that stay with the trade eventually gravitate toward studying hoof diseases. He too found that his camera turned to documenting case studies of hoof problems, and eventually focused on cases where Blue Green algae from Klamath Lake, Oregon was used as a nutritional supplement. Impressed with the quality of hoof material produced, when this rich food source was used, it became the main focus of his business the last ten years that he worked as a farrier. Eventually, he would only take on a rehab case if the owner would agree to feed AFA. After a few years of seeing consistent results, Wayne had to take the next step to find other Farriers who would conduct controlled case studies, using this new food source for horses. Many Farriers and trainers became distributors encouraging their clients to use the product and seeing the same results he had. It was with their help, and the help of his wife Jeannie, and friend Guy Franzi, that he came to develop a horse product,The Perfect Horse®. Wayne Blevins is now retired from the Farrier business, but is full time working to make The Perfect Horse® a household name among horsemen and women worldwide.